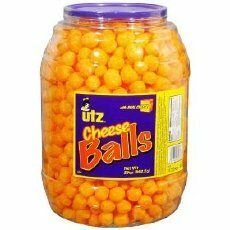 I’m More of an Utz Cheese Ball Man, Myself. I do like Cheez Doodles, but the local Sam’s Club prefers I buy the gigantic tub of Utz Cheese Balls. Prefers, hell, forces me! It’s the only cheese-like crunchy stuff they carry. Morrie Yohai was an adopter – an adapter – an innovator: He put his know how into making a new product out of an old one. 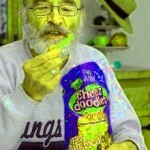 Dipsy Doodles were his inspiration. 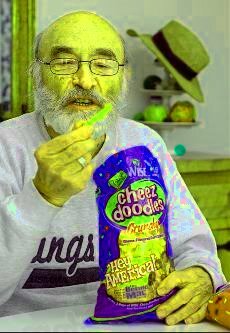 He changed the Dipsy Doodle machine he owned to make mushy cornmeal into little tubes and had them coated with “cheese” and other processed crap that would lead to addictive behavior and yellow fingers everywhere. His company also made ice cream cones – King Cones. Melba Toast. Yeah, that was Morrie’s company too. He died of cancer brought on by Yellow Fever. I bought some BAKED off-brand cheesy flavored tubular crunchy things last night. Had I known, I would have looked harder for bonafide Cheez Doodles. It’s the least I could do for Morrie and his legacy. Another smart guy dies just to beat U.S. out of some taxes! One of my favorite The Office episodes is when they are so bored they have a contest to see who can stuff the most cheeseballs in his mouth. Have you tried that?